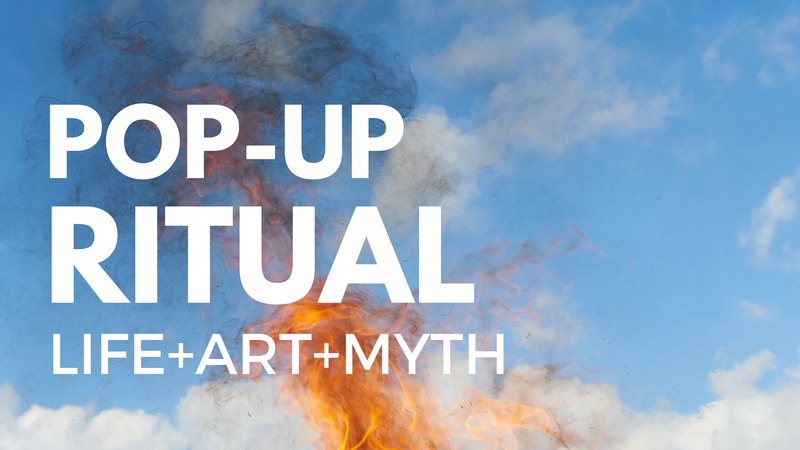 WHAT IS A POP-UP RITUAL? Pop-Up Rituals are events that harness the power of life, art and myth to create meaningful experiences and build a sense of community. This is accomplished through the use of many tools which may include: poetry, music, story, ceremony, dance, movement, singing, chanting, art, and contemplative practices. A key foundation to the Pop-Up Ritual is this: all beliefs, perspectives and people are welcomed and celebrated. Because Pop-Up Rituals are not promoting any particular perspective or belief, they are as likely to be held in public parks, stages and art spaces as they are to be held in churches, temples, mosques or synagogues (although they may be in these places at times, too). Each Pop-Up Ritual will engage a particular cause and donate a portion of the proceeds to a charitable organization. WHAT IS A POP-UP RITUAL LIKE? A ritual is a ceremony or process that brings attention and awareness to a particular moment. Rituals can be used to honor the past, to engage in the present, to look toward the future. They can be mournful, celebratory or reflective. These experiences awaken a sense of shared humanity and connection to others and the world. Does this sound interesting to you? Follow this link to contact us. As bright green leaves emerge from the stark of winter, so we too emerge and reconnect with nature as the season changes to spring. Join us in the Japanese healing practice of Shinrin Yoku, otherwise known in the West as forest-bathing, to celebrate season of rebirth. This mindfulness practice involves silently walking in the woods while engaging in sensory immersion, noticing all that is around us in the natural environment. We will begin with a tea service and introduction to the science and practice of Shinrin Yoku, followed by a silent meditation before beginning the walk. We will then immerse ourselves in the forest via a guided walk, and finally close with reflection and community. Two paths will be available for the Shinrin Yoku- one family friendly and one silent. Tickets are $10.00 and children are free. A portion of the proceeds will go to a charitable organization.